What are the top landmarks in Rome? Relax in wine bars and restaurants, take a walking tour and discover the famous Colosseum and other historic sites in one of Rome’s prominent districts. Explore Ancient Roman gardens developed in the 1st century B.C. and visit a spectacular Roman Catholic church in the 17th district of Rome. Listen to live music, try authentic Roman cuisine and stroll to Vatican City from this peaceful neighborhood in Rome. Discover one of Rome’s most densely populated residential areas and admire a spectacular 4th-century basilica and an Ancient Roman palace. Traveling to Rome? There's an extensive selection of hotels for tourists to choose from. Spend some time perusing Expedia's 2538 hotel listings, which are all within a 0.1-kilometre (0.06-mile) radius of central Rome. Rome offers visitors a selection of centrally located accommodations, including the Rocco Forte Hotel De Russie and THE FIRST Luxury Art Hotel Roma. With 2037 Expedia hotels, Rome Historic Centre is an accommodation neighborhood that could be a good place to base yourself. It is 0.5 kilometres (0.3 miles) from downtown Rome. 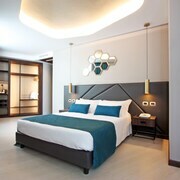 Hotel options here include the Manfredi Luxury Apartments and Hotel Eden. An alternative is Marino. Marino is where you'll find the One Park Hotel and Quality Hotel Excel Roma Ciampino. 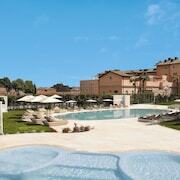 Or, try Lido di Ostia, where you'll find the Barceló Aran Blu and Rifugio San Francesco. The Patrizia Romana Palace and La Voliera B&B are in Monteverde Nuovo, and Hotel Stelle d'Europa and Barcelo Aran Park are part of the Cecchignola area. But of course, a visit to Rome wouldn't feel complete without a visit to the St. Peter's Basilica. 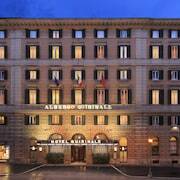 The Kaire Hotel and Grand hotel via Veneto, are all within easy walking distance from St. Peter's Basilica. Accommodation options close to the Pantheon include the Palazzo Manfredi - Relais & Chateaux and the Baglioni Hotel Regina. 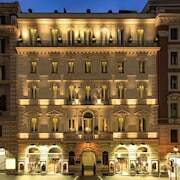 The Gran Melia Rome and Marriott Grand Hotel Flora are handily located within walking distance from the Spanish Steps. The Piazza Navona and the Arch of Constantine are other much-visited Rome destinations. The Mood 44 and the Sina Bernini Bristol are conveniently close to the Piazza Navona. 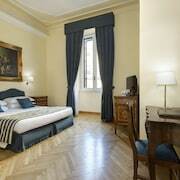 While the Daniel's Hotel and the Hotel d’Inghilterra Roma – Starhotels Collezione, are close to the Arch of Constantine. If you're traveling on a tight budget, you'll be happy to know that there's a solid range of cheaper accommodations in the vicinity of Rome. The La Valle dei Casali is 6 kilometres (4 miles) from the heart of Rome, while the Holiday Inn Express Rome San Giovanni is 5 kilometres (3 miles) away. 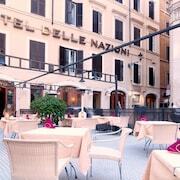 Other budget accommodation options are the Valle Hotel and the Hotel Philia Rome. 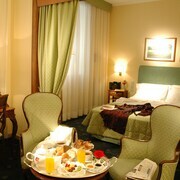 The Hotel Raphaël-Relais & Châteaux is located 0.7 kilometres (0.5 miles) from the center of Rome. Another alternative is the Residenza Ruspoli Bonaparte, which is positioned 0.1 kilometres (0.1 miles) away. 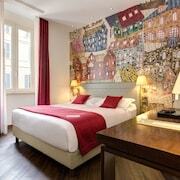 Two more options are the Grand Hotel De La Minerve and the InterContinental De La Ville. If you have time left, you might like to explore more of the Lazio region. Lazio boasts beaches, coastal plains, lakes and mountains. Popular Lazio visitor destinations are ruins and castles. In this section of Italy tourists may also partake in snowboarding, skiing and cross-country skiing. 60 kilometres (38 miles) from Rome you will find Civitavecchia, home to the Port of Civitavecchia and Aquafelix. Should you wish to stay in Civitavecchia, be sure to check out the Hotel San Giorgio and SunBay Park Hotel. 35 kilometres (20 miles) to the east of Rome, you may also choose to stay at Palestrina, home to the Wiki Hostel & Greenvillage and Residence Hotel Terme di Palestrina. The Sanctuary of Fortuna and Torrefazione The Coffee Velluti are a couple of the popular sites to experience should you visit Palestrina. Located 15 kilometres (9 miles) away from Rome is Ciampino Airport. Stay nearby at A casa di Anna e Tito or Quintili. Explore Rome with Expedia.ca’s Travel Guides to find the best flights, cars, holiday packages and more!